Lori Riner is a mom again — at age 48. 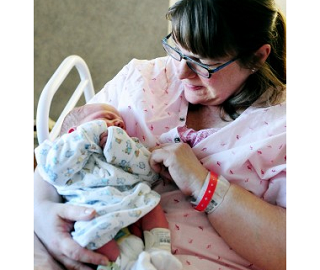 The Sparta woman gave birth Friday to a boy, and became the oldest woman to deliver at Franciscan Skemp Medical Center - without the aid of fertility treatment. Lori's 12-year-old granddaughter named the baby Tucker. At first, Lori thought she was going through menopause. But, she said, menopause doesn't kick. She asked her husband, Sonny, to sit down when she broke the news about the pregnancy. Of course, I was shocked, Sonny said. But I was happy. Most couples would be devastated, but we were not devastated. The couple has been married four years, and have children from previous marriages in their 20s and 30s, in addition to their granddaughter. Originally posted on February 20th, 2011.